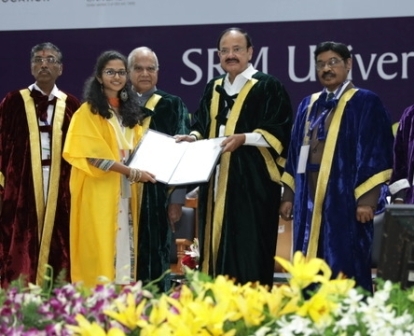 Calling on the graduating class at SRM University to be conscious of social structure, national outlook, culture, heritage and respect of parents and teachers, the Vice President of India, Mr. Venkaiah Naidu evoked Mahatma Gandhi’s saying that education without character is worthless. 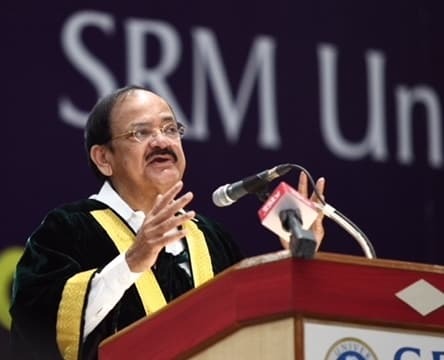 Calling on the graduating class at SRM University to be conscious of social structure, national outlook, culture, heritage and respect of parents and teachers, the Vice President of India, Mr. Venkaiah Naidu evoked Mahatma Gandhi’s saying that education without character is worthless. “You must have character, caliber, capacity, conduct and compassion. These five “C”s are very important. Instead what we often see are three “C”s: caste, community and cash”, he said at the Special Convocation where he was the Chief Guest and delivered the Convocation address at the theKattankulathur campus. The guests of honor at the event were the Governor of Tamil Nadu, Mr. BanwarilalPurohit, and the Minister for Higher Education of Tamil Nadu, Mr. K.P. Anbalagan. As many as 6000 diploma, under graduate, post graduate and doctoral students in various disciplines from the Faculties of Engineering and Technology, Science and Humanities , Medical and Health Sciences and Management received their degrees. About 185 students were presented Gold, Silver and Bronze medals for their academic achievements. “Higher education in India is passing through a phase of unprecedented expansion, marked by an explosion in the volume of students, a substantial expansion in the number of institutions and a quantum jump in the level of public funding. The enormity of the challenge of providing equal opportunities for quality higher education to ever-growing number of students is also a historic opportunity for correcting sectoral and social imbalances, reinvigorating institutions, creating new benchmarks of excellence and extending the frontiers of knowledge”, the Vice President said. “By education, I mean an all-round drawing of the best in child and man in body, mind and spirit”, said the Father of the Nation, Mahatma Gandhi. He also said: “Education which does not mould character is absolutely worthless”. As the Mahatma had rightly emphasized character is the most important quality for an individual to chart out the right path. Otherwise, despite having the privilege of getting educated in one of the best educational institutions, there is a danger of the individual going astray. The great Tamil poet and philospher, Thiruvallur said: “An uneducated person is like a barren land. His life is empty and useless”, he remarked. The Vice President maintained that education is more important for enlightenment and empowerment but the vision of education is to realize a greater access to people especially the vulnerable sections. And at a time when multi-tasking has become very important to meet then global competition, it has become imperative for teachers to update their knowledge and quickly learn Information and Communication Technology. “The new ideas and curricula must be relevant to the digital age. Everything must be on line; or you will be standing in the line”, Mr. Naidu remarked. A Convocation is an important milestone not only for the student but also the institution and SRM University has carved out a distinctive place in higher education by its academic distinction, the Governor of Tamil Nadu, Mr. BanwarilalPurohit said. “Tamil Nadu is a frontline state in higher education with an array of specializations and if people are making a beeline to this state it is because of the quality of education”, he remarked going on to say that studies should reflect flexibility, not rigidity and diversity promoted unity. “A University is not only for knowledge but also for research. Extra efforts must be made to improve the quality of knowledge . There has to be a periodical self evaluation and a road map towards global ranking”, the Governor said in his Special Address. Speaking before the Governor, Tamil Nadu’s Minister for Higher Education Mr. K.P. Anbalagan said that focus on higher education by the former Chief Minister Dr. Jayalalithaa for quality and inclusiveness gave Tamil Nadu a high standing nationally with 24 of the top 100 institutions nationally in the state; and the good work in higher education is being continued by the present Chief Minister. The gross enrollment ratio in India was 24.5, it was 44.3 in Tamil Nadu with female GER pegged at 42.4 in Tamil Nadu as opposed to 23.6 nationally, the Minister maintained going to say that SRM University imparts very good education and is considered as one of the top private universities. In his welcome address the Founder Chancellor of SRM Group of Institutions, Dr. T.R. PaariVendhar referred to the Vice President as a pride of South India and the hope of future India. “You are very special, by your elegant speech, punning upon words, with the thrust on morality, commitment and patriotism… you rose yourself from a farmer’s family to this level, by your hard work and devotion to duty. You are the pride of South India, and a hope for future India”, the Founder Chancellor said. Dr. PaariVendhar pointed out that out of 784 Universities in India only 150 were multi-disciplinary with SRM University in a Number 1 ranking. The institution has many national and international achievements such as successfully placing in orbit a satellite in 2011 to study water vapour and carbon dioxide and still tracked through a ground station established at the University campus. “Quite recently we were awarded a “four star” award by QS (Quacquarelli Symonds Limited) an international rating agency. Only 2 universities from India and 50 world-wide can boast of this” the Founder Chancellor said. “Finally I can’t stop mentioning about the sentiment of this university. Whoever addresses the graduands of this university, the next level of hierarchy I am sure awaits them sooner or later.This happened to our present Prime Minister, past President Mrs.Pratiba Patel, same for your goodself too” Dr. PaariVendhar said. Disclaimer: The information provided in this Notification is solely by SRM University., Jagranjosh.com bears no representations or warranties of any kind, express or implied, about the completeness, accuracy, reliability, suitability or availability with respect to the information. Individuals are therefore suggested to check the authenticity of the information.